It’s been an interesting week or so. A few good things, a few more not so great things. I won’t dwell on the bad stuff (except for a heavy cold I currently have – splutter, sniff, sniff seems to be my day at the moment), but I have been enjoying this early spring weather and have made the most of it out in the garden the last few days. Spring has just blown a gentle wave over the garden and there is so much new life – really quite magical. I can sit out there for hours and enjoy the sweet smells and the prettiness (well, as long as the children let me sit!). The Vege garden in looking in great shape, Fennel, Kale, crazy cabbages that never "cabbaged" but just grew huge, and the biggest abundance of Broccoli EVER. We are eating it with every meal (no lie). Any Broccoli recipes gladly welcomed. The spring bulbs are just stunning. One I am loving in my little Peony Tulip (the Peony is my favourite flower but unfortunately I can’t grow them in this warmer part of NZ – I used to have success further South in NZ) so this is a little pretend Peony. I have loads and loads of seedlings growing as well, my sweet peas and coriander are ready to harden off out, and I'm bound to have a heap more ready shortly. Better make some spaces in the garden for all of these delights! And some I’d rather never try again. I didn't photograph those ones though..... Even the girls won’t eat them (chooks didn’t mind though). I have a great recipe book from the library “The Aunt Daisy Baking Book” which has some great old fashioned recipes. 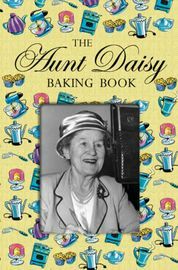 Aunt Daisy was a NZ radio host back in the 1930s, well known for her handy home hints (Aunt Daisy's home hints) and Baking secrets. Her recipes are interesting though. Most of her techniques assumed that baking was second nature to all with instructions such as “Bake in the usual way”, and never stated oven temperatures. This book has been adapted to fit more a more modern style of baking. The Afghan Biscuits were the best I have ever made (although the recipe only made a very small batch – obviously they were more rationed back in the 30’s than we are with baked goods now. Cream butter and sugar. Add dry ingredients. Roll into small balls (heaped teaspoon sized amounts) and cook on a cold oven tray in a moderate over (180C) for about 15 minutes. I also have a new lush early evening weekend treat drink. “Tangelo Gin & Tonic” that I found here. Divine!! And the blanket – it’s been decided by daughter number one that daughter number two will have it (as she wants more “blues” in her colours – is coming along nicely. And I’m sewing in the ends as I go now. Much better! Right - whip up a batch of that tangelo gin and tonic ... I'll be on the next plane hon! 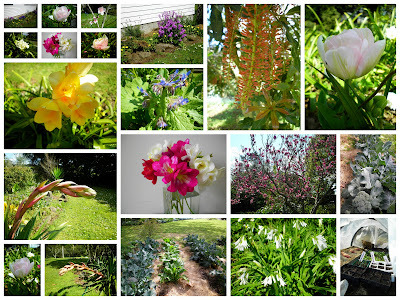 Loving your garden pics - boy you've been busy. That peony poppy is a stunner. And thank you for plugging my blog giveaway!! That tangelo gin and tonic looks amazing. Wish I were sitting out on a sunny evening drinking one. :) Love your giant granny square blanket. It's cute and cozy. I love how your Spring Summer starts just as ours ends. It means we get to see some lovely blooms. Gotta admit I love the excuse to snuggle under blankets though. Your big granny square looks lovely. ps. You're a No reply Blogger, so I couldn't just email you back a reply to your comment over at mine. Lovely photos of the goodies in your garden. Delicious. Although I'm not sure about never-ending broccoli!! And that blanket is looking stunning! Good on you for sewing in the ends as you go- very organised! I just stumbled upon you blog. How exciting! I love your flower photos (although I have to say that I'm a little jealous that it's your spring while it's most definately autumn here is Germany now)!